The Thanksgiving holiday is almost here. Have you noticed that each year Thanksgiving seems to be more and more about “Black Friday” than Thanksgiving itself? It’s sad to think that, for many, getting a good deal on more “stuff” is at least as important as being grateful for what they already have. Besides, most of us have enough, and many already have more than enough. But in the midst of all the holiday busyness, and especially on Thanksgiving Day, we would all do well to take time to reflect on all that we have been given and count our many blessings. 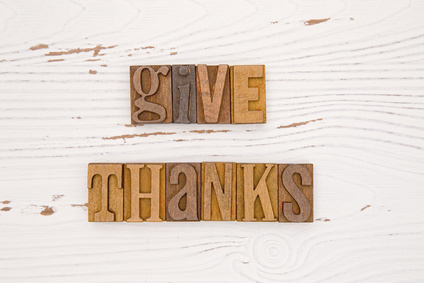 However, thankfulness and gratitude are things we can cultivate and practice every day. They are essential to contentment and foundational to Biblical stewardship. To better understand how thankfulness is related to stewardship we have to understand certain fundamental truths that we find in Scripture. We can then connect thankfulness, gratitude, and contentment to those principles and see how they are the appropriate heart responses to those truths. We don’t own anything. That’s because God created everything and he owns everything. The very first verse in the Bible says, “In the beginning when God created the heavens and the earth…” Also, in Psalm 24 we read, “The earth is the Lord’s and the fullness thereof, the world and those who dwell therein” (ESV). The Bible doesn’t teach that God created everything and then handed ownership off to us or someone else and retreated into the cosmic background. He always has and always will own all that is. Therefore, thankfulness first and foremost acknowledges that God is the creator and owner of all things. It follows that our acknowledgment of God’s ownership of all things – our time, talents, and treasure – helps us to see that they are God’s gifts to us and not ours to possess. Although God owns everything, he has nonetheless entrusted much to each of us to use for our good and his glory. Thankfulness changes how we use the gifts that we have been given. Thankfulness means that we receive all that God has given and then offer it back to him with a clear understanding of where it came from and why we have been given it in the first place. It changes how we view our vocation. It affects how we view our families and other relationships. It changes our attitude toward our material possessions and the giving of tithes and offerings on a Sunday morning. It impacts how we spend our time and how we serve in the context of our local church and community. It changes everything. Once we acknowledge that what we have is God’s and that anything that we have is a gift from God to use for him and his kingdom, we must then answer the basic question, “What should I do with all that God has specifically given to me?” As God’s stewards, we are responsible for caring for and managing all that God has graciously entrusted to us. A steward is simply a person who cares for something that belongs to someone else. The steward is not the owner, but instead manages that which belongs to another. All that we have and all that surrounds us in this life belongs to God, and we have been given the privilege to manage and care for some of it, whatever portion God has given individually to each of us. If we love God and are thankful for all he has given us, it will change our priorities. It will affect our calendars and our checkbooks – how we spend our time and our money. We don’t fulfill our responsibility to be a good steward strictly out of obligation or duty. If we put God and his kingdom first, it is an expression of the sincerity of our love and gratitude toward him for his many gifts. So even if we don’t get everything right with our stewardship (and none of us will), if we are motivated mainly by love, gratitude, and thankfulness toward God, then that great day of accountability (i.e., judgment) will go much better for us. The Bible makes it very clear that our attitude toward our money and possessions matters, so we will be held accountable for what God has entrusted to our care. God’s faithfulness in the past produces gratitude and thankfulness for all the ways he has met our needs. That gives us confidence in God’s ability to provide for us in the present and the future. God instructs us to trust him, even as we make serving and giving our highest priorities. Isn’t it interesting that we trust God for our eternal salvation but not necessarily enough to provide for us in our time of need? We receive everything as a gift, including our eternal salvation. But the Bible also teaches that there will be rewards for faithfulness and loss of them due to unfaithfulness. As Jesus said in Rev. 22:12, “Behold I am coming soon, bringing my recompense with me, to repay each one for what he had done.” (ESV) Therefore, eternal rewards should be one of the key motivations for faithful stewardship. But It is important to understand the nature of these rewards. It can seem like a “merit” system based on works instead of grace, which seems to undermine the idea that we practice good stewardship out of love and gratitude toward God. There is no doubt that we are to serve the Lord out of love for him and his glory. Nonetheless, the Bible promises us rewards. The basic principle is that God grants us salvation as a gift of grace that is received through faith, but he also rewards us for good works done because of grace. And not only that but God also graciously provides us with the capacity to serve him. I Cor.15:10 says, “But by the grace of God I am what I am, and his grace toward me was not in vain. On the contrary, I worked harder than any of them, though it was not I, but the grace of God that is with me.” (ESV) God is at work in us to change our hearts as we appropriate his grace, but the decision to love and serve him, and the diligence we apply in doing so, are our decision and our responsibility. It is those things that God rewards or not. Biblical stewardship begins with how we view what God has given us. We start with an attitude of humility, gratitude, and thankfulness, recognizing that all we have comes from him. Then we carefully consider how we will use all that God has entrusted to our care to serve God and our neighbor and also take care of our own needs. We do all this because we hope to one day hear the Lord say, “Well done, good and faithful servant” just as the master said to the servants to whom he gave five talents and two talents in Matthew 25:21. The servants used what they had been given to manage and multiplied it for the good of the master and his kingdom.